Wii Fit Studio across the series. Wii Fit Studio (Wii Fit スタジオ, Wii Fit Studio) is a stage in Super Smash Bros. for Wii U and Super Smash Bros. Ultimate. Wii Fit Trainer is fought here for her unlock battle in Ultimate. Wii Fit Studio is a walk-off stage, consisting of a large floor extending to the lateral blast lines, with no pits of any kind. The background features a giant mirror reflecting the battle, which allows viewers to see beyond the normal limits of the screen, but not beyond the blast lines. The mirror can at times disappear, being replaced with a white background featuring silhouettes which demonstrate yoga positions. 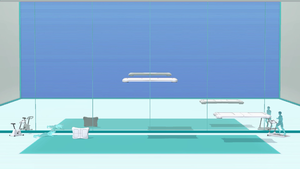 While the mirror is active, two or three Wii Balance Boards acting as soft platforms can descend from the ceiling, remaining present for some time before ascending again. The layout of the platforms is randomly selected from 125 different configurations. Like the platforms on Umbra Clock Tower, Prism Tower, and Magicant, they disappear just before touching the upper blast line, preventing fighters from being KO'd by them. An animated Wii Balance Board waddles around and occasionally stops and stretches facing the camera, but has no bearing on the battle. At times, a Wii Fit Trainer's voice can be heard, giving instructions on yoga positions. In Ultimate, the human silhouettes from various on-screen indicators in the Wii Fit series appear as background characters, performing yoga and using the exercise machines. Star KOs and Screen KOs are disabled on this stage, due to the mirror. In 8-Player Smash, the mirror does not appear. In Super Smash Bros. for Wii U, the Ω form removes the walk-off element and Wii Balance Board platforms, and the platform extends below the blast line. The mirror does not appear, instead having only the background with the trainer's silhouette. The trainer's voice lines can still be heard. The walking Wii Balance Board is also absent. In Super Smash Bros. Ultimate, the Ω form and Battlefield form are similar to SSB4's Ω form; however, the main platform does not extend below the blast line and is resized and reshaped to match Final Destination and Battlefield, respectively. The three soft platforms of the Battlefield form are Wii Balance Boards. The studio as it appears in Wii Fit. The stage is based on the Wii Fit Trainers' studio in Wii Fit, which they appear in when they interact with the player. The Wii Balance Board is a Wii accessory that is used to play the Wii Fit games and is available as part of the control scheme of some other select games. An animated Wii Balance Board acts as the player's advisor in the Wii Fit games. Wii Fit Studio is universally banned from tournaments due to the presence of walk-off blast lines which encourage camping and allow for early KOs. Additionally, the mirror in the background can increase the chance of lag occurring, as well as potentially creating a distraction to players. Added 8-player mode version of the stage. The existing Ω form remained at a max of 6 players. Added 8-player mode version of the Ω form. Wii Fit Studio in Super Smash Bros. for Wii U. A battle on Wii Fit Studio. Note the mirror in the background. The stage with a yoga position in the background. Two Wii Fit Trainers and the Wii Balance Board. Wii Fit Studio's default layout in-game. Ice Climbers grabbed by the Arcade Bunny's claw on the stage. Incineroar reaching for a Smoke Ball on the stage. Male Robin and Toon Link taunting on the stage. Jigglypuff using Rollout next to Togedemaru on the stage. It is normally impossible to be Star KO'd or Screen KO'd on this stage. Using game modifications, it is possible to enable these KOs on the stage, resulting in strange effects. Star KO'd characters will appear to fly closer to the stage and at some angles will even appear to be in front of the stage. Screen KO'd characters will be seen in the mirror and will sink into the ground. This allows viewing of characters' Screen KO models and animations in their entirety. In Super Smash Bros. Ultimate, Alucard is one of seven Assist Trophies that don't appear on this stage. During a tournament hosted by Nintendo Spain on December 14, 2018, it was stated that he doesn't appear because the stage has a giant mirror, referencing how vampires do not have a reflection in a mirror. This page was last edited on April 17, 2019, at 02:42.